New E45 Endless Moisture Derma Restore is a breakthrough for high street beauty products, it contains a unique and patented combination of 3 premium ingredients (usually found in high end face creams) to combat the 3 key problems associated with mature skin.Including natural moisture-magnet Glycerine and skins best friend Poly Hydroxy Acid (PHA) E45 Endless Moisture Derma Restore also contains Nicotinamide,a form of Vitamin B3 which is proved to boost collegen production. The new body moisturiser has had some fantastic reviews and clinical data and promises softer and more supple skin in just 3 weeks. 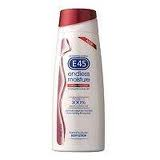 I began using a this new E45 moisturiser myself after I had been sent one to try a few weeks ago.I decided to use it twice a day for a few weeks to see how it worked.I applied it mainly to my legs and arms every morning and every night.It was a nice creamy moisturiser with a very non greasy feel.It soaked in pretty quick which is always good for me as i hate waiting around for it to dry in.There was no perfumed smell,just fresh and clean smelling. After a few weeks im happy to report that my skin is feeling great,I feel like my legs are noticeably smoother and feeling softer than ever.Due to the fact that i ad not been bothering to moisturise before,im glad to know it does make a huge difference to my skin.I shall deffinatley be keeping up my daily routine and at just £4.59 per 200ml bottle i can easily afford to. I would give this Endless Moisture Derma Restore a great 5/5 as i had no problems with it,it didnt irritate my skin at all and left my skin feeling great. Hi, I have used E45 cream for as long as i can remember,and have allways had soft youthful skin,I am 65 years old and people i meet cannot beleive my age.The trouble is that since Victoria Beckham told a magazine that she uses it i can,t get it in my shop anymore,So i have come on the net to see if i have better look.